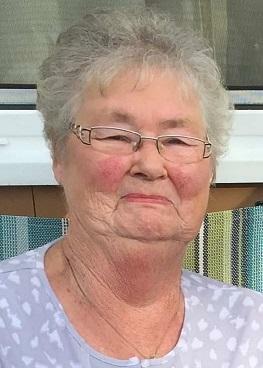 It is with great sadness, the loving family of Catherine ‘Andrea’ Walker of Frenchvale, announce her passing on Monday, April 15, 2019 at the Cape Breton Regional Hospital. Andrea was born May 24, 1940 in Benacadie West, Cape Breton. She was the daughter of the late Dan N. and Catherine MacNeil. Andrea was predeceased by her husband and the love of her life of 52 years, Dougie. Mom is survived by her greatest joys, her children, Kathy (Eric) MacRae, Donald Walker, Kim (Albert) Jollymore, Kevin (Gabe) Walker, Kent (the late Kareen) Walker, and Koreen Lahey. Andrea was the most precious grandmother to Natasha (Chad), Joel (Crystal), Francis (Melissa), Kelcie (Vadim), Stephen (Kate), Mary Kate (Liam), Meaghan, Sarah Jane, Patrick Douglas and Hannah. She watches over her beloved great-grandchildren Miah, Grady, Jake, Finley, Edie, Max, Isla and Olivia. Andrea is also survived by her sisters-in-law, Gabrielle (her best friend), Mary Jeannette Bennett, Christina MacDonald, and her brother-in-law, Aubrey Bonnell. She cherished a special bond with Patrick Lahey, Wallen Chang-Hong and Kenny Hong, as well as nieces and nephews. Mom was predeceased by her son, Douglas Gerard; sisters, Marion MacNeil and Edwina Bonnell; her beautiful daughter-in-law, Kareen; her brothers-in-law, John and Danny Walker, and sisters-in-law, Rhodena Currie and Katie Wall. Mom loved her community of Frenchvale. She was a longtime member of St. Mary’s Parish and founding member of the Frenchvale Road Volunteer Fire Dept. and Ladies Auxillary. Since Dad’s passing seven years ago, Mom travelled the roads from Frenchvale to Boisdale and North Sydney, all in the name of a game of cards. She loved her friends dearly, and always made sure to have a great time. To Mom, you were the boss of our family who brought love and joy to us all. Family gatherings will not be the same, but we will live by your example and cherish each moment we have with each other. Dad is now enjoying your baking in heaven and making sure the tea biscuits aren’t burnt! We will miss you, Ma. We would like to extend our sincere gratitude to Dr. Greg Myatt, who gave her such wonderful care over the years and a special thank you to the IMCU and Palliative Care. In lieu of flowers, donations can be made to the Arthritis Society or St. Mary’s Parish Frenchvale. Visitation will be held at TW Curry Parkview Chapel, on Wednesday April 17, 2019 from 5 p.m. to 9 p.m. Funeral Mass will be celebrated at St. Mary’s Church, Frenchvale, on Thursday April 18, 2019 at 11 a.m. with Fr. Vargheese Puthuparambil presiding. Online condolences may be left by visiting www.twcurry.com.